Leading By Example. This Award is designed to highlight and acknowledge the person in the family who is living a life of example by bringing honor to the Hibbert name and legacy in the work and deeds that is done in daily life. The Leading by Example Award was created to let the family know that all work is honorable work, to always do your best, because someone is watching and noticing you. This award is given to a person in the family who is an example to all generations and has allowed God to use his/her life to do good work on this planet. This award is designed to thank its recipient for working with character and integrity in their chosen profession and for allowing the world to witness our family values in such a public way. The recipient of such an award has created big foot prints for others to follow. The honoree was chosen based on the pride that we hold for the service that this person does in their life, work, and voluntary activities. This year’s winner of the Leading by Example Award is a person who has taken the Hibbert name into the Boardrooms and backrooms of one of the largest and oldest companies in America. She started at her present company over a decade ago and has risen to her present position by carrying out her professional responsibilities with integrity and fairness. To those who know her well, she is a sister friend, cousin, niece and daughter. To those who are getting to know her she is simply just lovely to be around. Because of her work, she is often in the spotlight both locally and nationally. Her work has helped others to achieve their dreams and her connections and networks have provided her with resources beyond measure. She is truly one of the families best kept secrets. Until now. Leading by Example, is just that; she is a leader that we are willing to follow. And it is with pride that we formally and publically announce that she has recently been named Vice President of Operations and Human Resources at Black Enterprise Magazine. 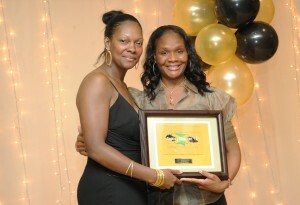 The winner of the 2010 Leading by Example Award is presented to Natalie M. Hibbert.